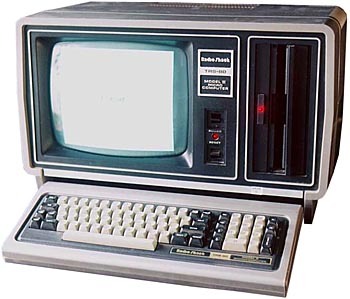 The TRS-80 model II, is the obscure brother of the TRS-80 family. Many internet pages deal with the models 1,3 and 4 but omit the model 2... This is maybe because the TRS-80 Model 2 was intended to be a business computer for use in offices and labs. Thus it is equiped with a full height Shugart 8'' drive with a capacity of 500k which is a lot compared to the 87k offered by the TRS-80 Model 1 system disk. It is also possible to connect up to 4 floppy disk units, so you could have 2MB disk space online ! It runs under TRSDOS, but can also achieve CP/M compatibility. Options for the machine included a hard disk controller, an arcnet network card, a graphics card and a 6 MHz 68000 board set with extra memory (up to 512K) so it could run XENIX. Actually, there was a Hi-Res Graphics Mode for this machine, which mapped every pixel on the screen (still in monochrome). There was very limited software for it. The machine had the capacity in hardware to utilize multiple 64K banks of memory but this was never implemented in production software. This is the same techiique the IBM PC and other clone 8-bit machines achieved 640K of memory (10 banks of 64K). This machine could also read IBM formatted Mainframe and data entry unit disks. The data entry units (IBM 3742's I think) would write information directly to 8 inch floppys as the operater depressed the Carriage Return button, and then the disks could be taken from these large units and insterted into the drive of the model II for verification and other checking. I recall a Model II being expressly used for this purpose. It also came with a neat Radio Shack acoustic coupler!! These machines did experiance frequent power supply problems though! SIZE / WEIGHT Heavy ! see more Tandy Radio Shack TRS 80 MODEL II Ebay auctions !